Anyone who reads my work knows I am not a fan of Sandbox/Voxel creation games. They just don’t interest me. There’s [generally speaking] no story. 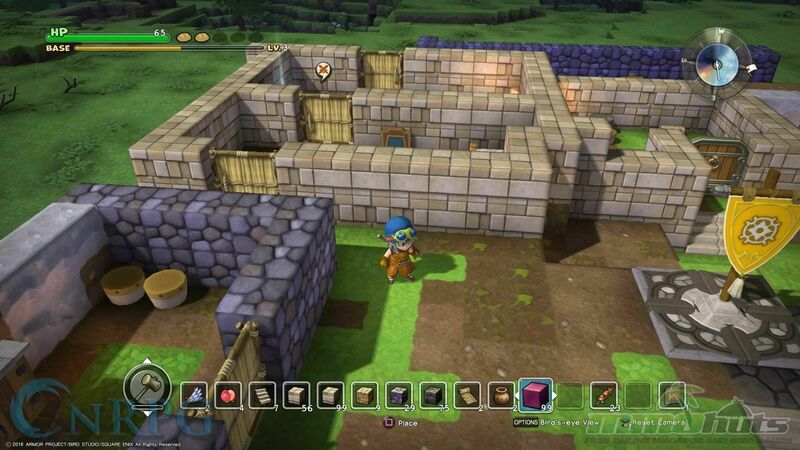 However, Dragon Quest Builders is a beast that is more than worth the price tag if you’re into these games. Even if you aren’t and are just a fan of Dragon Quest, there’s enough lore and story for you as well! 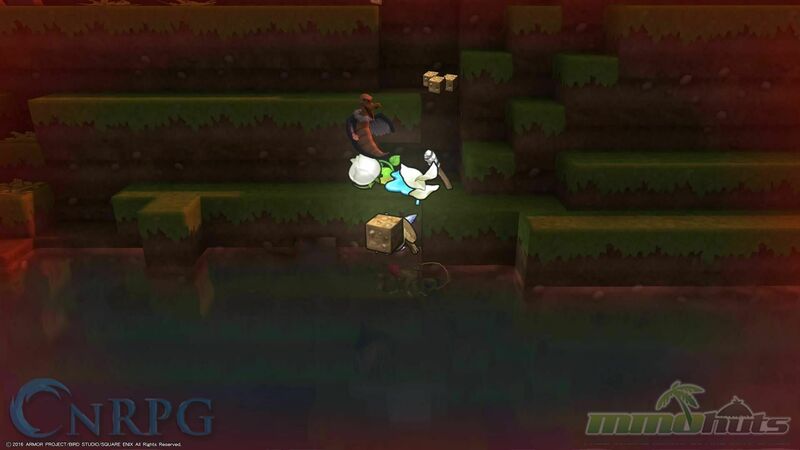 The game is set in the land where the Erdrick/Loto trilogy takes place [Alefgard]. You’re Bildrick in the demo, but you can rename to whatever suits your fancy. The most interesting part of the story is that it is an alternate ending to the original Dragon Quest. When you reach the Dragon Lord, deep within Charlock Castle, he offers you a chance to join him and rule half the land. 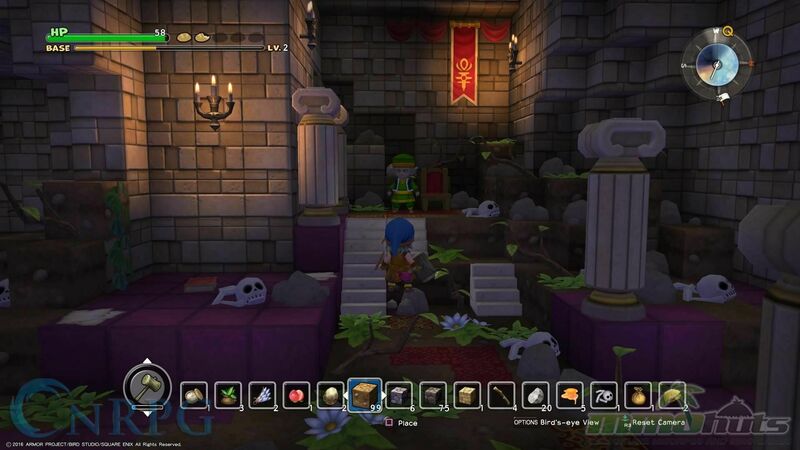 In this game, the Descendant of Erdrick accepts, and rules half the land with the Dragon Lord. However. . . it was a trap because he’s the damn Dragon Lord! The Hero is eliminated, and darkness swallows the land. People begin to mistrust each other, civilization falls into darkness and cities disappear. But you are the Builder. The last person to have the power to create. 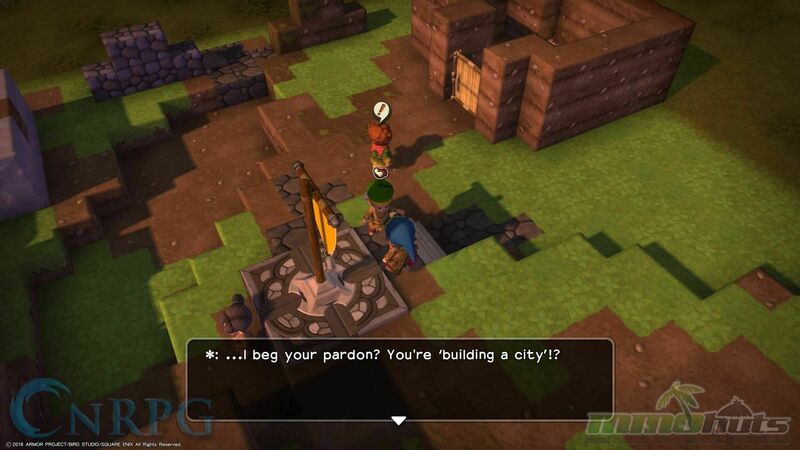 So your ultimate goal is to build civilization back to its former glory and finally defeat the Dragon Lord. This is not a game you’re going to beat in a sitting or two. I spent the past week playing it virtually nonstop, and though I am getting closer and closer, the game is not over yet. There’s the main story mode and you can also unlock an open mode [Terra Incognito] where you just design ridiculous structures with no story behind it. Want to rebuild a spot for spot remake of Tantegel Castle? Go for it! Though you can certainly do that in the regular story with enough time and dedication. You’re not really a Hero. Obnoxious, kind of annoying, and even though he never says a word, you can tell he’s snarky by how people react to him. So how do you undertake this ridiculous task? The main goal is to rebuild Cantlin, one of the greatest cities on Alfegard. It was a city that was prosperous, happy, and wealthy. They even had a Golem, a gigantic golden one that defended the city in times of danger. There are rumors from some of the people you meet that the Golem betrayed the city, but you’ll just have to find out yourself! 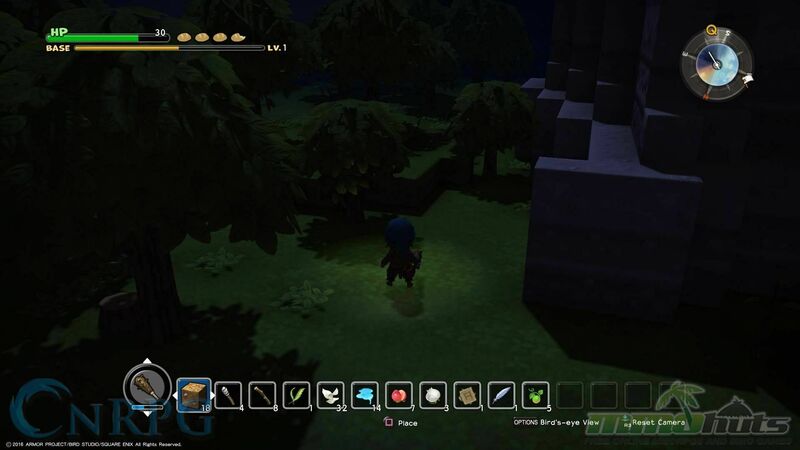 You start with a tiny beacon where you can save your game, and the light from it can help lure some of the first people to your fledgling base. You have a few bits of earth and grass, dilapidated ruin and in general, just a pile of crap. 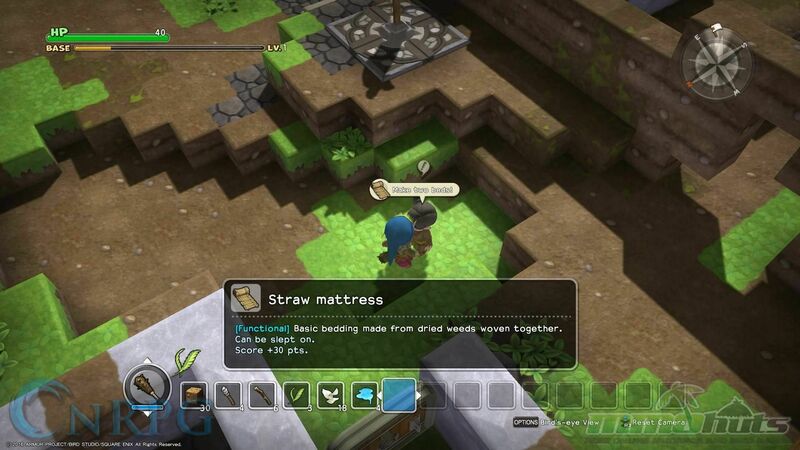 You’re given menial tasks to perform that will help you get acquainted with the style of gameplay, for those of you who don’t play sandbox builders. 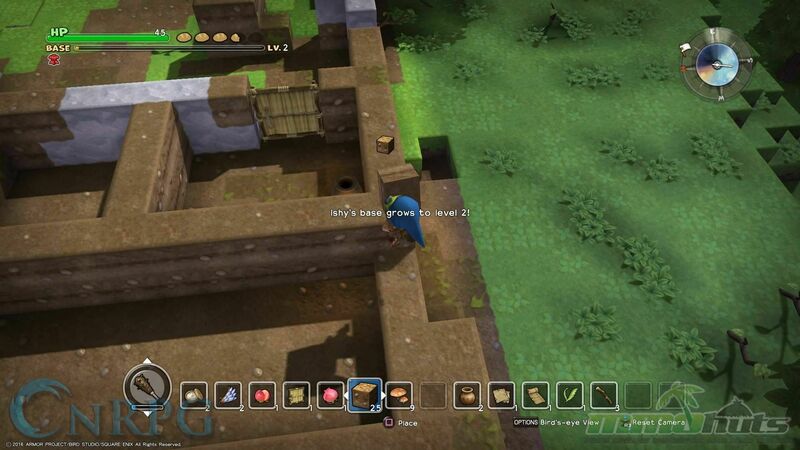 The game starts with the ability to work with just dirt, making walls and creating straw doors for a modicum of privacy. 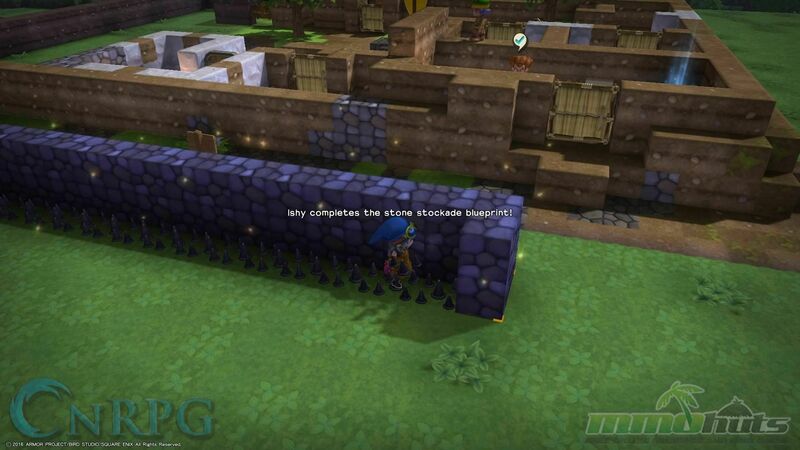 I say privacy but if the wall is too short, enemies can just jump it to annoy you. 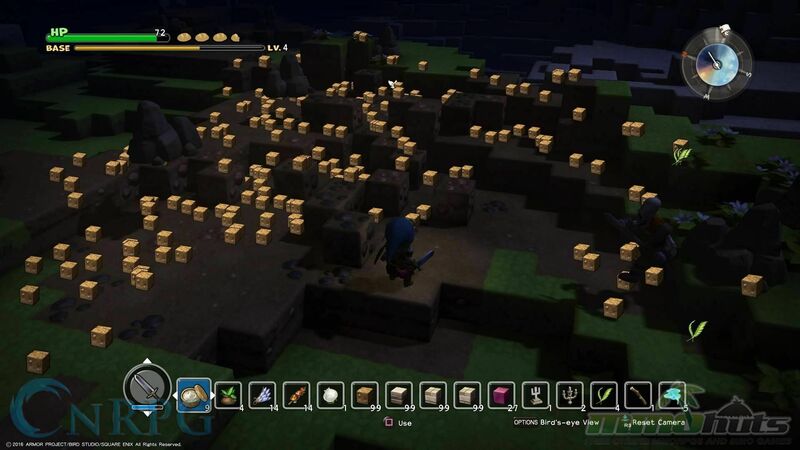 The world is mostly open, and the first enemies you see are, of course, Slimes! 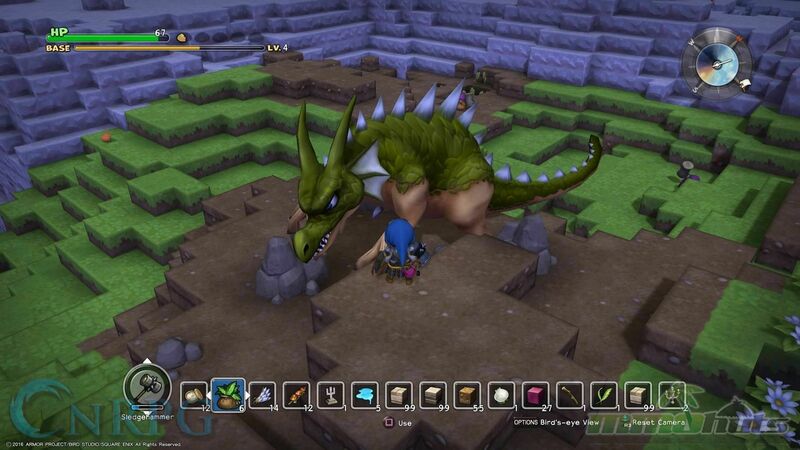 The tried and true Dragon Quest enemy, you see Blue Slimes, Drakees, and then they jump it right up to Wyverns! 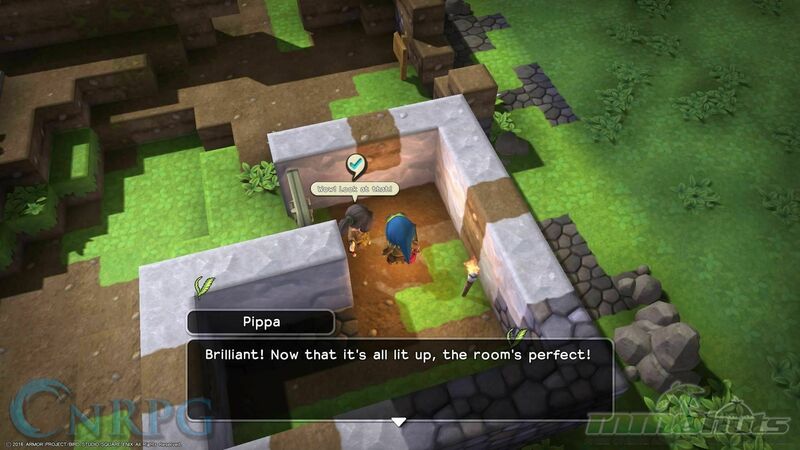 Speaking of attacks, one of your townsfolk keeps you up to date on when huge invasions are going to happen. Fortunately, if you aren’t ready, you don’t have to endure these attacks. You just have to say “No, I’m not ready” and you can do them at your own pace. That’s the great thing about this game. It’s all about when you want to do it. You don’t ever have to feel like you’re rushing from one objective to the other. 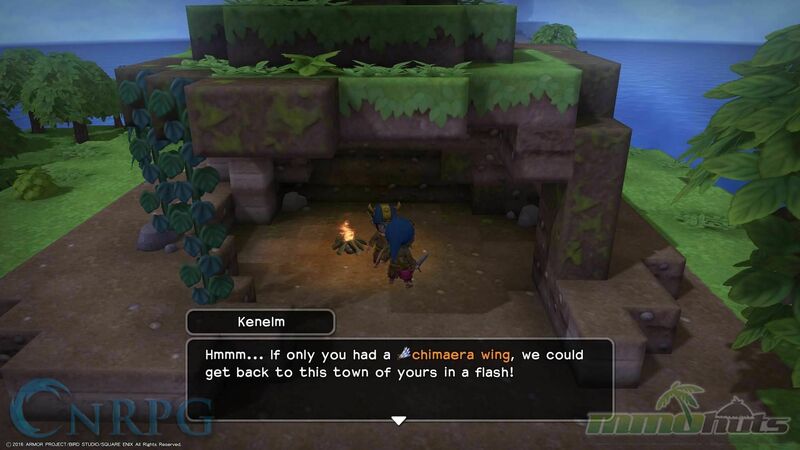 Would you rather go do one of the side quests out in the wilderness? Do that instead! Come back to battle when you’re ready. But on the subject of these missions, there are lots of them. 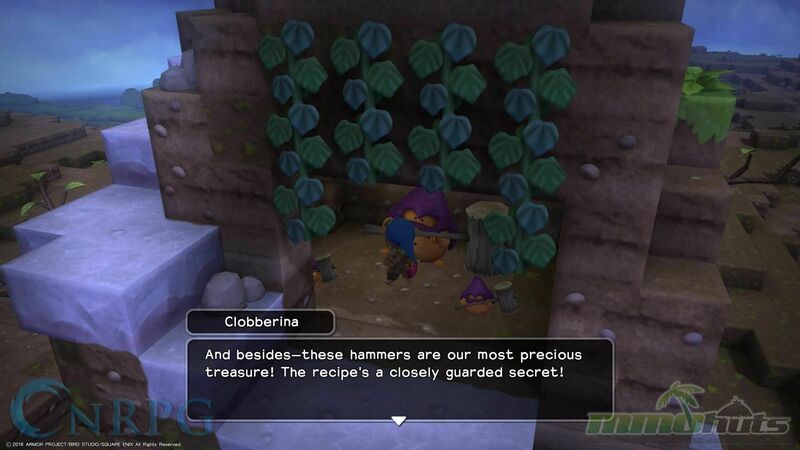 Hammerhoods for example, apparently like gardening. And you’ll meet a pair of them in the wilderness and one wants his garden to look like his friends. You have to reorganize his garden without destroying it. Eventually, you can build a shovel to do just that. But what’s the catch? It won’t track on your world map. You have to hope you remember where it is/you carve a particular path of destruction to it. I also hate that you can’t see the whole map at once, but that’s neither here nor there. 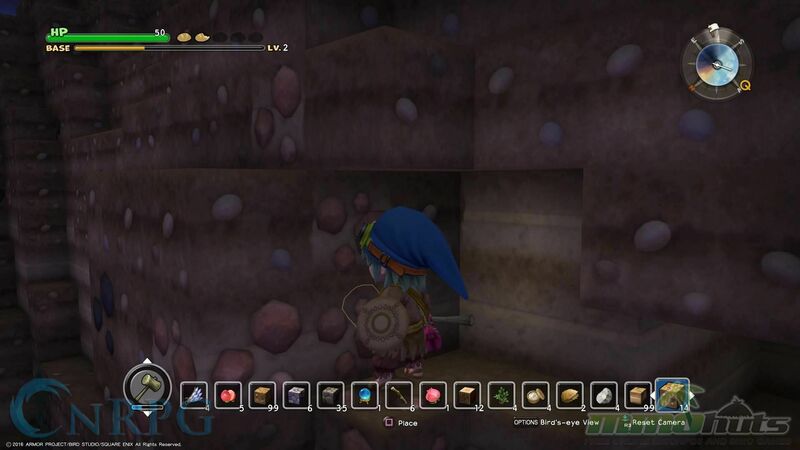 But not showing everything on the map IS in the vein of Dragon Quest. Those games back in the day were all about exploring, and learning stuff for yourself. There are several of these missions that I just misplace/forget about because I don’t remember where in the expansive world it is. 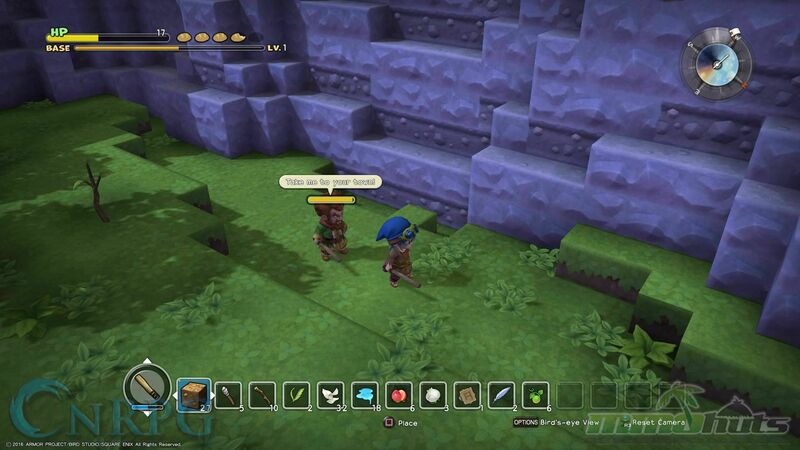 Even some of the missions from your townsfolk can be hard to locate! But that’s the beauty of the game: You are not racing the clock. Play at your pace, when you want. So how do you rebuild society as a single man? Why that’s simple! You do what your new friends say. 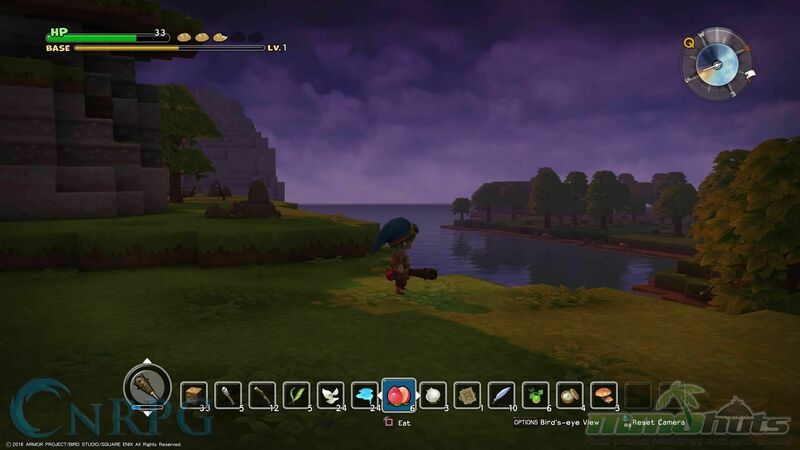 The ideas they give you for the town will spontaneously help you create new things, like doors, new armor and weapons, bags of medicinal herbs, etc… In the early going you have to use your weapons to farm for Earth, but before too long you’re given a new mission! You will notice there are several islands off in the distance, and you cannot build a dirt bridge to get there. 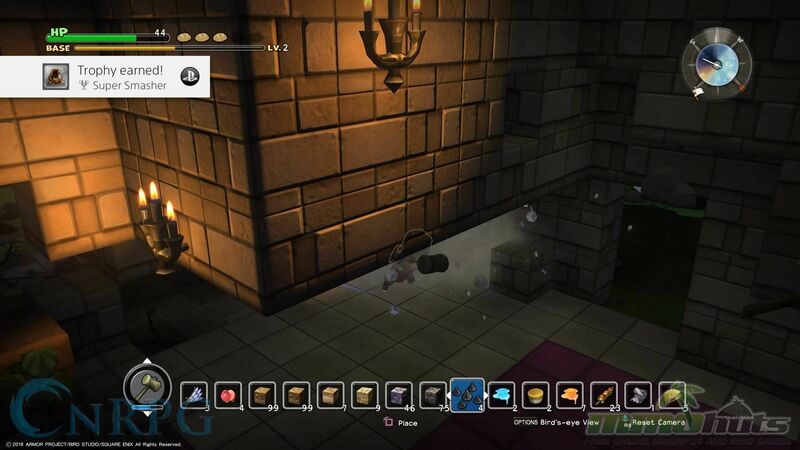 You’ll receive/build/uncover Teleportals, which take you to these places. Hammerhoods will help you get the Hammer. It will be a staple for the rest of the game [until you get stuff like Sledgehammers], and I do recommend carrying several hammers at all times. Every item you equip will have a durability and while it’ll get better, eventually armor, shields, weapons, and hammers will break. Trinkets/Accessories won’t thankfully, since you can’t build them, only find them in the world. So how do you acquire materials? Just like in any other building game, you have to dig for it. You’re going to dig. Forever. And there are points on the world where you can either dig your way to a new path or gently traverse around the mountains and risk falling in the water. You can’t swim, and falling in the deeper water will deal you damage and resurrect you. Shallow water is fine, deep water? Eh, not so much. Death isn’t a big issue in this game though. Being killed by a monster isn’t game over; it doesn’t take you back to your last save. You simply resurrect, because it’s “Not your time to die” according to the mysterious voice guiding you through the early game. Some of your items fall off of you when you die, but it’s simply a matter of getting back to that point. Bildrick doesn’t gain EXP/levels with killing enemies, though you’re going to kill a lot of bad guys. So how do you get better? By learning how to build bigger, better ways to kill things. Steel Swords, traps, and much more. You do get upgrades to your character such as the Spin Attack, which will deal much more damage to anything in your path, enemy and landscape alike. It’s a much better method of farming too. Dig deep into the ground where the coal and iron is, activate it and you begin a strip mining process faster than ever occurred in Captain Planet. They drop useful things to build with, like goops of slime that act as dyes, to Scorpion Horns that go into your sledgehammer. 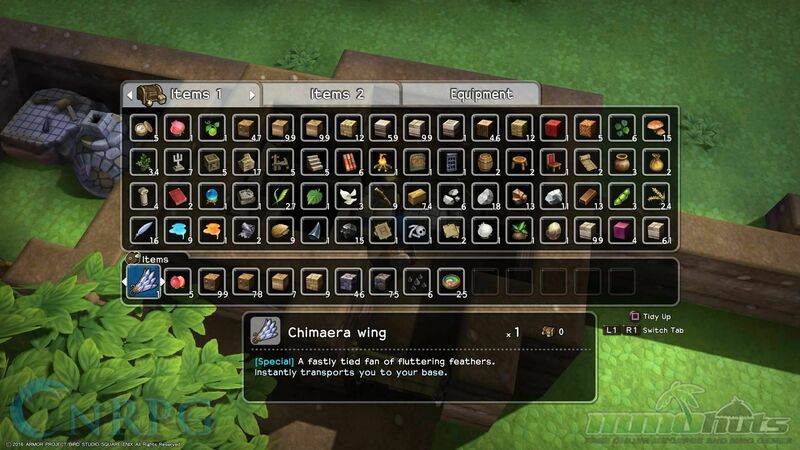 Wyverns drop a feather, which goes into the Wing of Wyvern item [return to your base]. Curiously, Green Dragons drop Fireplaces. I don’t know if it’s a pun, or just that rare of a piece of building material. 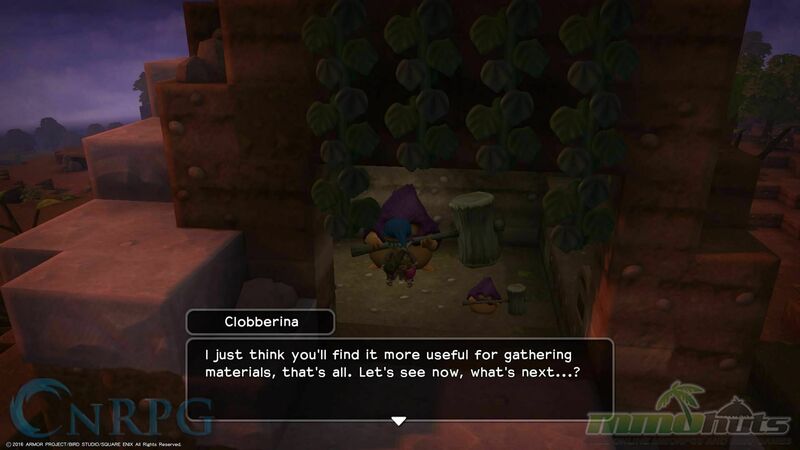 Speaking of materials though, that’s probably the worst damn part about this game. I love it, but farming some [many] materials is going to take up most of your time. So how do you expedite some of these processes? Find a structure that already existed and find a good place to start destroying it, whether the top or bottom, and bring a LOT of hammers. Once you have the Colossal Coffer, anything outside of what you can carry will go there. However, I very swiftly ran out of room in that too, and you can only have one. Solution? Don’t keep mundane building stuff in it. 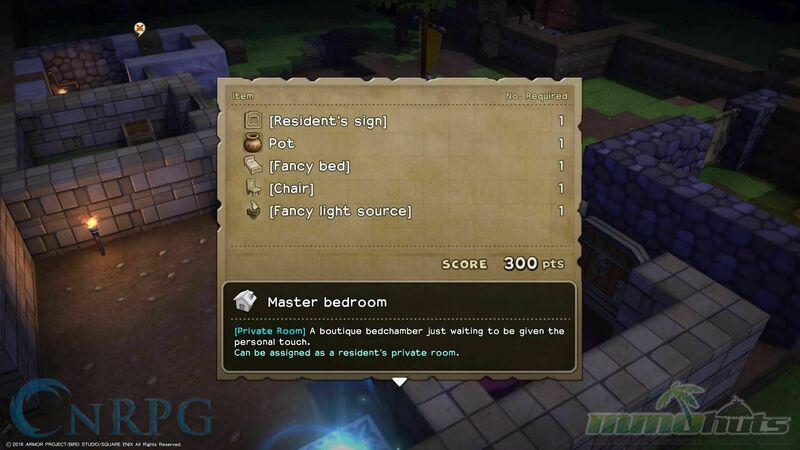 Build lots of chests. I keep a chest in every room I build and just organize what I need where I need it. Food stuff in the kitchen and so on. You’re going to farm a lot. Another helpful tip to make things easier is to build in Earth, and use built items that transforms those dirt bricks into Stone. 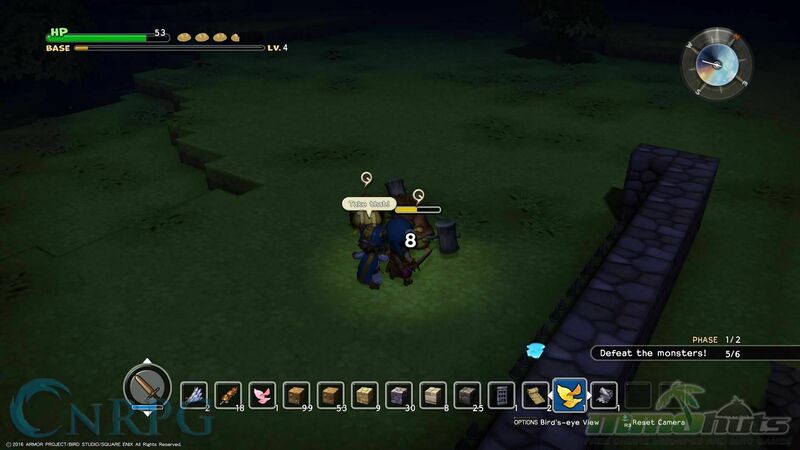 I also obliterated old Cantlin to use their Castle blocks to build my town. It’s gotta look fancy. 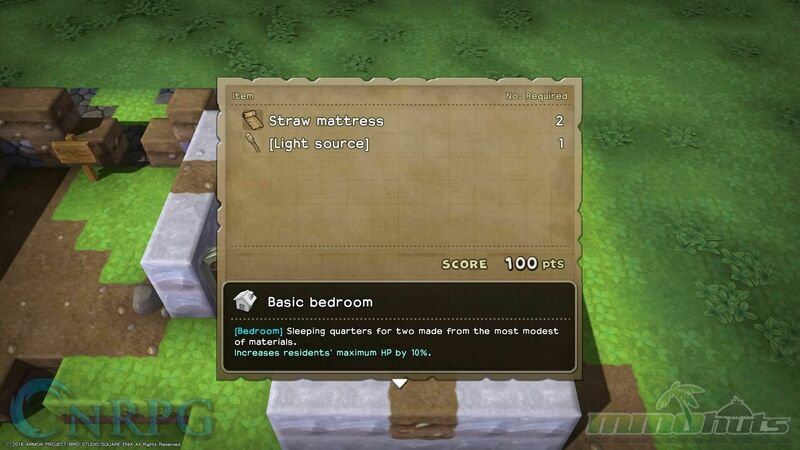 However some of the building requirements are annoying and will require a lot of farming. 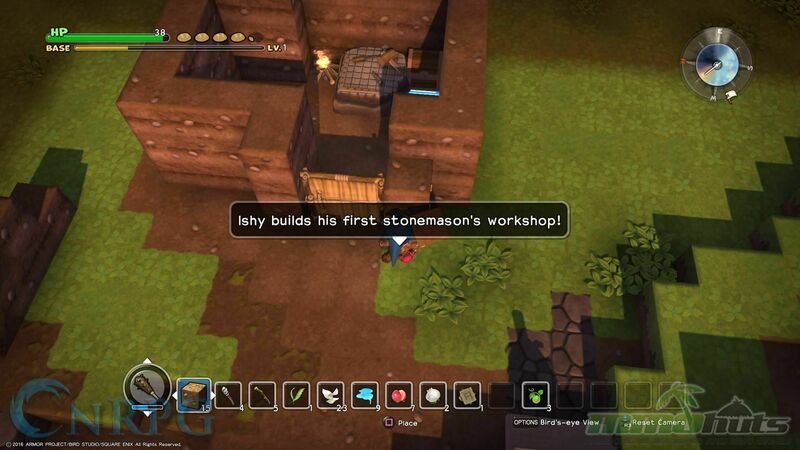 While yes, this is a building game, the farming’s going to get annoying. 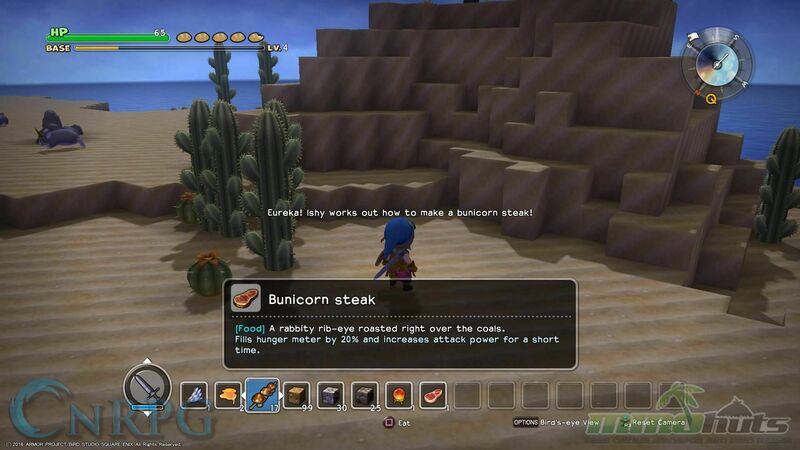 One of the big things people will no doubt say is “It’s Minecraft! It’s Minecraft! 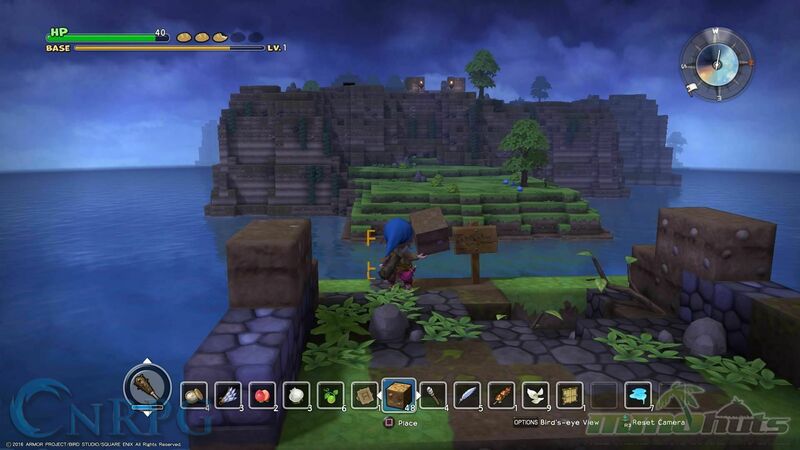 You can build stuff, farm, craft, and kill monsters in the wild!” And while yes, this is all very true, Dragon Quest Builders goes several steps further. 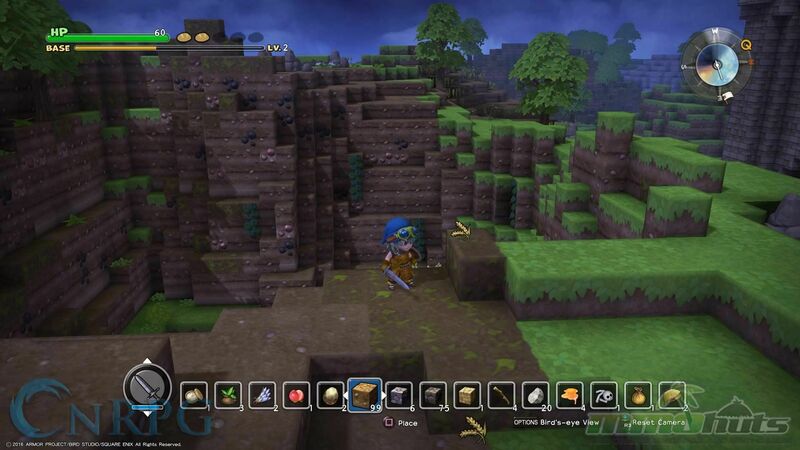 It’s not a randomly generated world. The world is created and broken into Four Chapters, each with their own story missions and lands to explore. 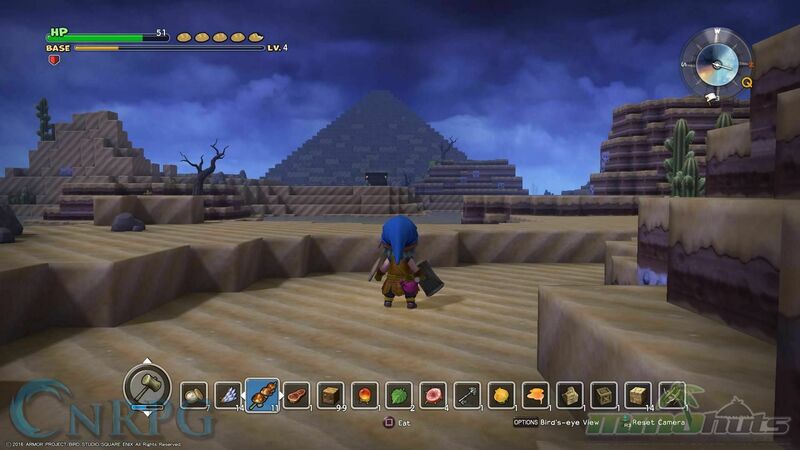 It’s the perfect blend of RPG and Sandbox building. It’s not complex or terribly difficult to get into, and it’s absolutely fun for the whole family. It’s not multiplayer, and that’s perfectly fine. This is a solo journey of a young boy or girl who is going to change the world for the better and bring the light back to the land. 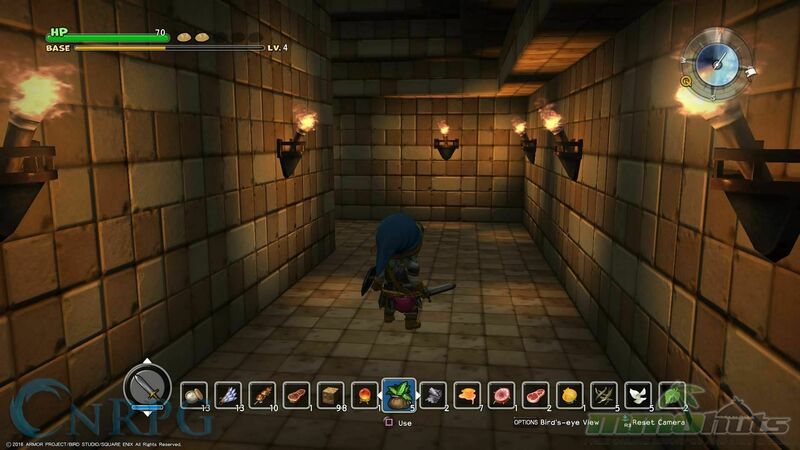 The length of Dragon Quest Builders is all dependent on how you want to play the game. The more detail and depth you put in, the longer it will take. There’s no restriction in how you build, and only occasionally are there specific blueprints to follow. 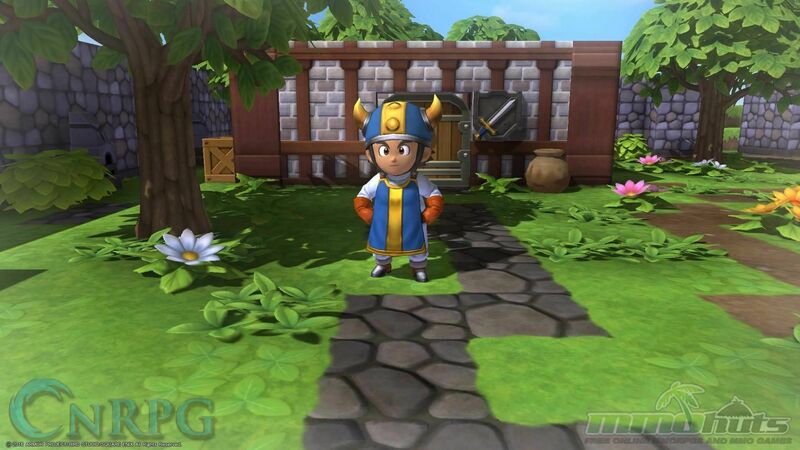 There’s so much nostalgia going on here; fans of the Dragon Quest franchise will adore it. I do think even non-DQ fans will be able to get into it. The story and gameplay are not deep, but there is simply so much to do that you won’t feel like there is a deficit anywhere. I love that every iconic Dragon Quest enemy I was hoping to see, I saw. Ghosts pop up at night, anywhere and everywhere and cast spells and look spooky. Dragons sit in the wilderness and snore away. 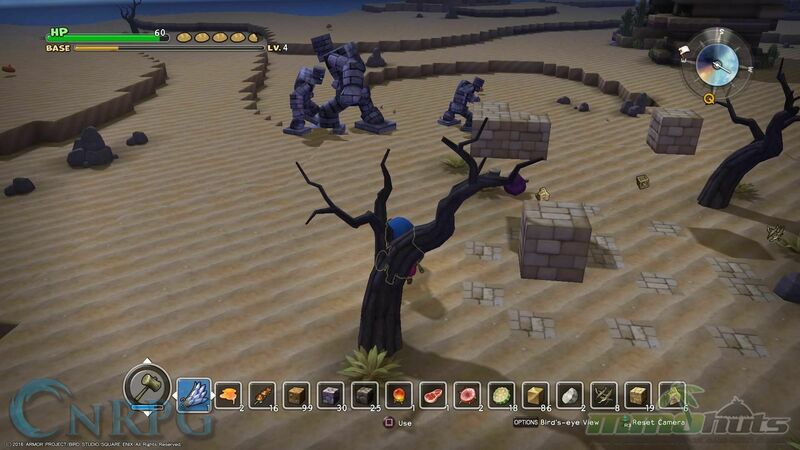 Axe Knights, Golems, Ogres, everyone! It has just enough structure to keep me involved and enough story to make me want to explore everywhere. There’s a series of signs that document the world falling into darkness, and so I am hooked. 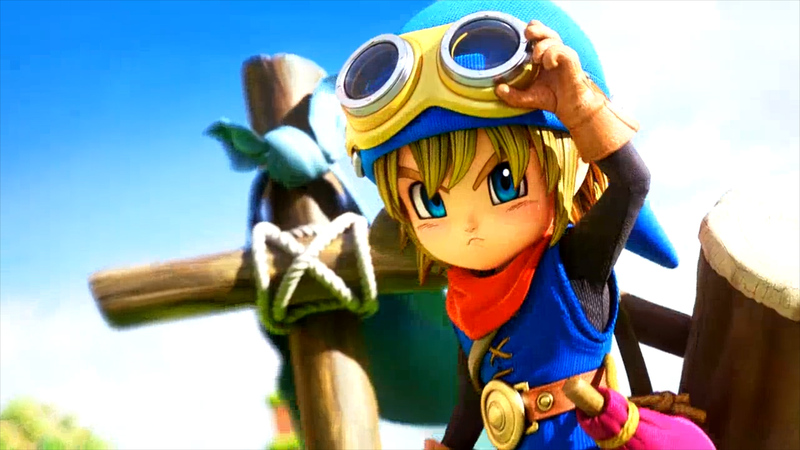 It’s a clever sequel to Dragon Quest 1 that I always thought I needed. It’s the story I always wanted. + More RPG than Sandbox. It’s a beautiful blend of two styles of gameplay. + No timer, no clock to beat. You can play this at your pace for as long as you want. – Harvesting important materials will take a nightmarish eternity. – Running out of item space is a genuine threat. – Pretty easy; possibly too easy.